The Academy Awards is a night to honor the success in the film industry over the past year. The 86th Academy Awards, hosted by Ellen DeGeneres on Sunday March 2, was a night of pizza, Twitter crashes, and a lot of little gold men. Gravity, a space-thriller starring Sandra Bullock, dominated the evening with a total of seven Oscars including best visual effects, original score, and cinematography. Director Alfonso Cuaron also took home best director for the film. 12 Years a Slave, a pre-civil war era film about the evils of American slavery, won best picture at this year’s Academy Awards. British director Steve McQueen made history Sunday night by being the first film from a black director to win in Oscar. 12 Years a Slave also won best supporting actress for Lupita Nyong’o and best adapted screenplay. The low-budget film, Dallas Buyer Club, won two Oscars. Matthew McConaughey won best actor for his portrayal of a homophobe with A I D S. Jared Leto won supporting actor for his portrayal of a transgender woman. Leto’s touching acceptance speech moved the audience around the world. The hilarious Ellen DeGeneres made history many times this past Sunday. The host actually broke a Twitter record when she posted a “selfie” including Brad Pitt, Angelina Jolie, Jennifer Lawrence, Bradley Cooper, Channing Tatum, Jared Leto, Meryl Streep, Julia Roberts, Kevin Spacey, and Lupita and Peter Nyongío. DeGeneres stepped off stage and gathered these Hollywood elite and possibly captured one of the most famous “selfies” in the world. She posted it on Twitter and within a couple of hours the photo already had 2.5 million retweets, breaking the record for this site. 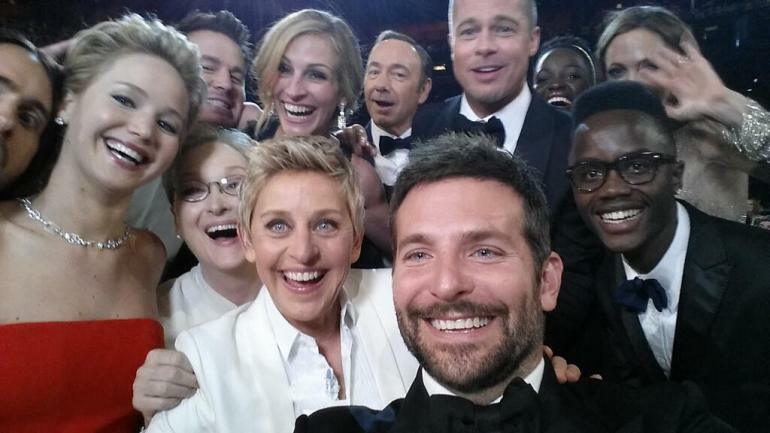 Ellen’s iconic selfie at the Oscars broke Twitter and its record for most-retweeted-photo ever. Ellen DeGeneres also got the audience’s attention when she ordered pizza for the stars in the crowd. She then brought in a real pizza delivery guy and handed out pizza to the celebrities with Brad Pitt handing out paper plates. The lucky delivery guy then got a $1,000 tip from the hostess. The 86th Academy Awards was deemed a success. Between heartfelt speeches, and silly jokes, the night paid tribute to the art of film making.